Lake Wilson - Meet at the Walker Avenue boat ramp (see map ) at 9:30 for a 10:00 AM launch. No carpool - 5 Mi. R.T.
Cash For Trash - A Club service project: Paddle up the Ka'elepulu Stream to Enchanted Lakes, picking up trash on the way back - different categories of trash win different cash prizes (categories will be announced by Gary). No carpool. - 2 Mi. R.T.
No carpool - 3.5 Mi. R.T.
Fri 22 Full Moon & Fireworks - Meet at “Hilton Heliport” at 5:30 for 6:30pm launch from Duke Kahanamoku Beach. (Kulu moonrise at 7:30pm.). Arrive early, parking can be difficult! Bring snacks and drinks and some way to illuminate your boat for the paddle back. White is a good color, or light blue cayalume sticks. Please, no red or green lights: they confuse other boaters. - 2 Mi. R.T.
Sun 24 Ke'ehi Lagoon to Ewa Beach- along the Reef Runway and across Pearl Harbor Channel. Long carpool for this one, be ready to leave "Alan's Ramp" (see map ) at 8:00 AM, Be at Ewa Beach no later than 8:30 a.m. for the return shuttle. Launch at 9:00 a.m. - 8 Mi. Sun 3 Sherwood Forest “Surf Crash & Burn” Clinic - Prequalification for the club's neighbor island trips. Practice launching and landing Scupper Pro's (or equivalent) touring kayaks in surf conditions. Learn to implement safe procedures, observe conditions early, and practice various techniques. Meet at Sherwood Forest (Waimanalo State Recreation Area, across from the polo field), 9:00 am. The Big Kahuna (Moku Manu): - Kailua Boat Ramp to He’eia Kea Pier via Mokumanu. Meet at Kailua BR at 8:00 am and be ready to leave for carpool to He`eia Kea at 8:30 sharp; launch upon return about 9:30am. Stops at Mōkōlea Rock & Mokumanu cave (The latter is dependent on no live-fire exercises at Mokapu Range, and calm water. )- 12 Mi. Keehi Lagoon Surfing & Island Clean-up - Launch from "Alan's Ramp" at 8:00 AM if you want to surf; volunteers for the cleanup effort can wait 'til 10:00 - everyone meets at "Blue Pool" (on Kahaka'aulana Island) at 10:30. Bring footwear (tennies), gloves and HD trash bags. La Mariana Sailing Club for lunchafterwards. Very low tide at 8:05 AM.- 1 Mi. R.T.
Fri 19 to Sun 21 Easter Weekend at Sand Island Park - Potluck and Paddling, races; some camping in individual sites. Gate hours: 7:00AM to 7:45 PM. Easter Bonfire - well, no, actually. Individual campfires are allowed, however, in the fire rings. 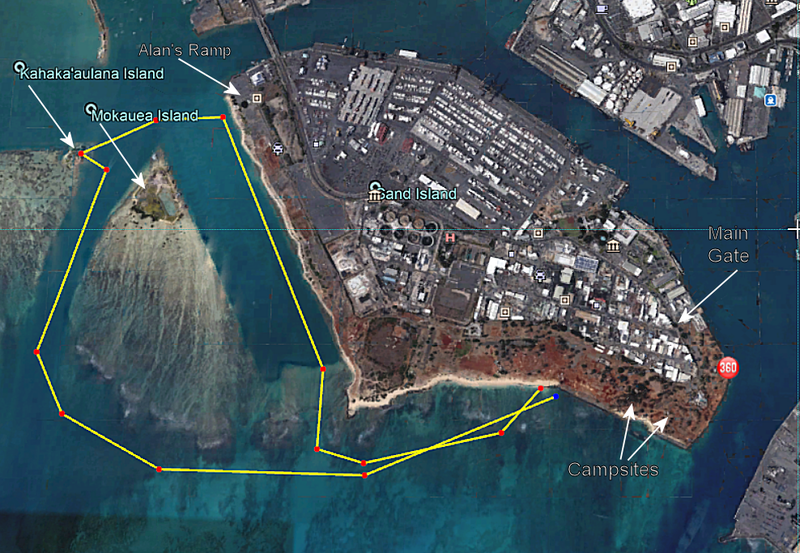 Sailathon: Kahala to Ewa Beach (Waikiki to Wai'anae) - a loooong paddle, for sure! Not recommended without a kite or sail. All ACA safety gear must be carried, paddlers must be pre-approved by Steve prior to showing up. Meet at Kahala Beach (Waiala'e Beach Park) no later than 8:00 AM for a long carpool.- 17 Mi. Paddle ratings are for average weather and ocean conditions, and are unscientifically assigned and often arbitrary. It is up to each individual to assess the conditions prior to the time of launch in the light of their own experience and ability, and decide whether to go or not. If you decide to go, you must sign the trip roster and read the waiver. No signee, no kayakee. In the event of a Small Craft Advisory (SCA) or higher wind warning*, the Club-sponsored paddle is officially cancelled. Trip leaders should download a copy of the release/waiver by clicking here for a PDF file you can print. *As broadcast by Radio WBA on UHF weather channels 1 or 2, or announced the night before on commercial television. "Steerage Board" meetings are held on the first Tuesday of every second month, except where otherwise noted, at the location given in the schedule. These meetings are for the Officers and Advisory Board members to discuss business and decide future activities for the Club, and they are open to any Club member in good standing who has a Club-related issue to be dealt with outside the forum of the General Meetings. Talk to any Club Officer for details, an agenda, or location directions. 1) You will need a "Freshwater Game Fishing License," issued by the State and available at most fishing-supply and sporting-goods stores like Walmart, Nanko's and McCully Bicycle. The cost is $5 for Hawaii residents ($3 for minors under 15), and is good for one year. It is good for fishing in any freshwater location in the State, if you decide to try your luck elsewhere. It is also available online*. A new requirement: Henceforth, you must also have a "Wahiawa Public Fishing Area Entry Permit" also available (free-of-charge) at the above stores and online. *If you leave it to the last minute, you can purchase a fishing permit online directly from the DAR. You'll need a credit card and a printer, and it will cost you $1 extra "convenience fee" per person, but it's instantaneous, and it is good for one calender year (12 months from date of purchase). You may also be able to pick permits up on your way there at Walmart in Mililani , 95-0550 Lanikuhana Ave.
Commercial and freshwater fishing licenses, along with other aquatic licenses and permits, are being issued at the Division of Aquatic Resources office in Room 330 of the Kalanimoku Building, 1151 Punchbowl Street, Honolulu. Licenses and permits are no longer being issued at the first-floor counters. Hours are 8 am to 3:30 pm Monday-Friday, closed on State holidays. Division publications, such as fishing regulation booklets, are available free at the office. The Division's fish posters can also be purchased at the new license counter for the price of $3.